In the spring of 1992 I indulged my inner Annie Leibovitz and took a Basic Photography class at the Cambridge Center for Adult Education — tucked in an old house with warped floors in the middle of Harvard Square. We learned the old-fashioned pre-digital ins and outs of f-stops and depth of field. We talked shutter speeds and film types, and practiced the mysterious alchemy of the dark room — dipping paper in chemical baths until, voila, a grainy black and white image appeared. I wandered solo on photo safaris to Mt. Auburn Cemetery and in Harvard Yard, hoping to look more artist than tourist as I focused my lens. It was a brief love affair, me and my camera in our quiet, dark room. Since then, I’ve abdicated most family photo ops to Noel, whose eye is quirkier than mine, and who knows how to charge the camera batteries and download pics to the computer — new fangled technicalities I’d rather not bother with. Around Christmas a friend gave Noel her father’s old cameras — a lovely leather-encased Kodak Retina IIIc — a 1955-era German-made marvel, and an early Canon A-1, a trusty SLR hyped at the time as “the first camera in the world in which all information, both input and output, is in pulse signals”, i.e. digital. They are collectors’ items, relics of another era. For Christmas, Noel gave me a tiny pocket-sized Panasonic Lumix, so I can point and shoot to my heart’s desire, especially for blog photos. I love the juxtaposition of our camera acquisitions: his — the classic, hefty, manual machines that required knowledge, intention, patience and skill; and mine — the modern, mindless, quick and easy. 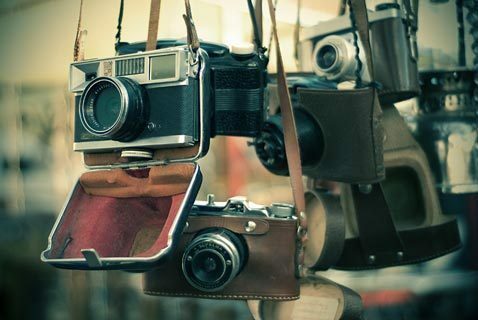 And I particularly love imagining what the owner of these old cameras looked for, and saw, through his lens. The moments he tried to capture. The beauty he beheld, the memories engraved by light on film. On my frequent trips to mom’s house, we dig through old photos, piecing together family history and fashion trends through curvy-edged sepia images. My cousin Sara recently brought over a new trove to cull through, including one of my grandmother on the beach in her bra. Memory lane is rich and lovely, and I’m thankful for each point and click, each squint of eye and winding of film, that delivered those singular moment in those years, years ago, to me now. Stories, glimpses, expressions, exposures. I travel lightly with my fully automated snazzy new Lumix. What will I focus on? What apertures dare I open? How much light will I let in, and for how long? ~ by Stephanie on 01/20/2011. Well, if that photo at the top of this post is an indication of your eye, I’d say that however quick and accessible the camera you’re making something beautiful from what you see! Susan and Stephanie, friends for 17 years, got the same news within months. Susan’s father and Stephanie’s mother have been diagnosed with A.L.S. Lou Gehrig’s disease progressively stills a life – muscles cease to work, speech fails, the body withers – while the mind and spirit seem to brighten in intensity. This is a journal of two women, both divinity school graduates, both living in Charleston, SC, both, at heart, writers, speaking into the Silence which grows around them. Observing, in moments small and ordinary, the way a life stilled is still a life – and often a luminous one. Click here to follow us.